Chelsea’s Willian da Silva appears to be continuing his football career in Old Trafford as he is reportedly ready to switch to Manchester United. Chelsea on the other hand are speculated to have agreed on a deal with Manchester United. English giants Manchester United had tried to sign the 29-year old Brazilian last year but didn’t succeed and it appears they have seized the opportunity of Barca’s slack and have agreed on a deal for Willian. A speculated deal worth €75million is said to be agreed upon for Willian’s transfer and this is within the range of what Barca offered Chelsea and was rejected but Willian is determined to leave Chelsea this summer. 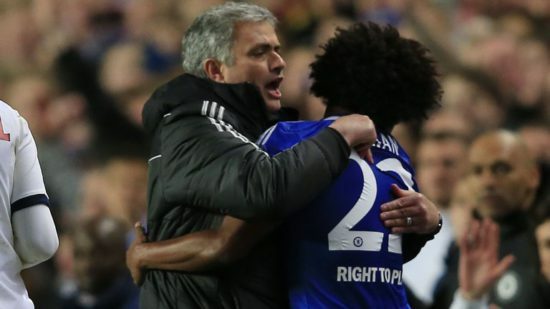 A reunion between Manchester United head coach Jose Mourinho and Willian is hoped for as he had a good working relationship with the Brazilian international and Mourinho was his former boss back in Chelsea. Willian joined Chelsea in August 2013 on a five-year deal worth £30million and on his 200th appearance for the Blues, Willian scored twice and won two penalties in a 4-2 win against Qarabag making Chelsea qualify for the knockout stage in the Champions League. It is hoped that coach Mourinho reunites with Willian and the star player bolsters the United squad as they prepare for the new season.